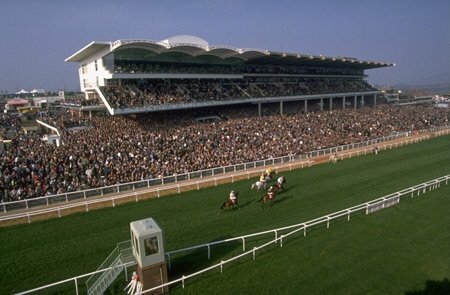 It’s pretty hard to criticize any aspect of the Cheltenham Racecourse or the Cheltenham experience as a whole because it is essentially the Mecca for virtually all national hunt enthusiasts! One thing to be aware of though is that on their busiest days, it can be difficult to get around, buy a drink, and even place a bet. That’s all just part of the Cheltenham experience though, so just be sure to allow yourself some extra time on the busy days (such as during the newly expanded Cheltenham Festival in March). There are two tracks at the home of National Hunt racing. The Old Course is around a mile-and-a-half long and is oval in shape, whereas the New Course is a little bit longer. Both courses have stiff fences and a stiff uphill finish. The racecourse is approximately one mile north of the town on the A435. It can be reached by exiting the M5 at junctions 9, 10 (southbound only) or 11. AA signs lead to the track. Free parking is available, except during the Festival when it costs £5. Check out our new Cheltenham Festival today. To Cheltenham Spa. A return bus service operates between the station and the course. If you’re looking for the very best odds for all of the Cheltenham Racecourse races, we highly recommend checking out the online sportsbooks featured below. These sportsbooks represent some of the biggest betting exchanges in the world, and as such, you can place a wide variety of bets at the odds that you choose! All of these online sportsbooks are extremely reputable, so we’re confident that you’ll enjoy placing your Cheltenham Racecourse bets at each and every one of them! When it comes to placing Cheltenham Racecourse bets online, one place that we never hesitate to recommend to any of our website visitors is Paddy Power. They have been around for years and they have a great reputation amongst bettors from around the world, so we’re confident that you’ll be impressed with everything they have to offer! At the moment, they are giving away up to $50 in free bets to all of their new customers, so head over to Paddy Power today to learn more about this great offer! Click here to bet on Cheltenham races at Paddy Power! As the banner above indicates, all new customers at Bet365 are currently eligible to receive up to $200 in free bets! All you have to do is create a new account, make your first deposit, and you’ll instantly be eligible to claim your free bets! Bet365 is one of the biggest sportsbooks in the world and they have plenty of races that you can bet on, including plenty of Cheltenham races that you’re sure to be interested in, so head over to their website today to get in on the action! Click here to bet on Cheltenham races at Bet365! If you’re familiar with horse racing and betting on the races, then there’s a good chance that you’re also familiar with Ladbrokes. That’s because they are one of the oldest and most trusted sportsbooks in the world; both offline as well as online. The great thing about this sportsbook is that they feature virtually every race imaginable; including all Cheltenham races! At the moment, they are giving away up to $50 in free bets to all of their new customers, so head over to Ladbrokes today to take advantage of this great offer! Click here to bet on Cheltenham races at Ladbrokes! Unless you’ve been living under a rock for the past decade, you’ve probably heard of Bodog at least a time or two. That’s because they are one of the most popular and innovative sportsbooks available online! They’re known for offering great odds on virtually every race imaginable; including virtually all Cheltenham races! So if you’re in the mood to place some bets from the comfort of your own home, we highly recommend doing so at Bodog today! Click here to bet on Cheltenham races at Bodog! When it comes to UK racing, the festival season is one of the best times to place your wagers online because that’s when some of the largest meets take place. This means that there is more prize money up for grabs, which leads to lots of excitement that online sportsbooks can’t ignore! Because of this, you’ll often times find better odds and special bonuses to help celebrate the festival season! That’s particularly the case during the Cheltenham Festival, which is second only to the Grand National. So whenever the Cheltenham Festival is going on, we encourage you to keep your eyes peeled for special bonuses and great odds that you won’t want to pass up! !